While there’s plenty of history to Marvel’s cosmic heroes, the modern storylines all really begin with Annihilation. As events go, Annihilation is something to behold. The writers and artists reinvent seemingly tepid characters, interweave all the strongest fan-favorite characters, and tell a story that is truly for all the marbles. If the good guys lose, it’s total annihilation for the entire Marvel Universe. 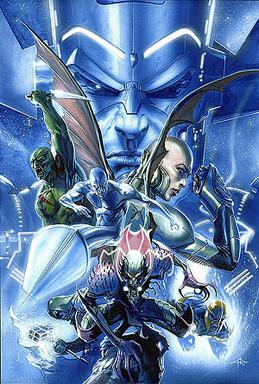 In many ways, the pages of Annihilation center around Richard Rider, Nova, but these pages also begin to formulate the core of the Guardians of the Galaxy. Mix in Thanos, Galactus, Silver Surfer, and a classic Fantastic Four villain with a newly increased threat-level, and you have the makings of an instant classic. Book one is all prologue and backstory, and the trade is inclusive of the stories included above. While it might seem tempting to skip over this “backstory” it’s actually pretty essential to the Annihilation narrative and should be considered chapter one rather than a prologue. Strangely, Book 2 is significantly less essential than book one. The second trade collects tie-in adventures of Ronan the Accuser, the Super-Skrull, and the Silver Surfer. While all these characters are all-time Marvel cosmic greats, the stories told here are varying degrees of quality. The Ronan and Super-Skrull stories in particular are shaky. Silver Surfer, on the other hand, is filled with relevant narrative developments and explains a LOT of the story you’ll begin in the primary Annihilation arc. Long story short: This trade is relevant for continuity purposes, but not the strongest material of the bunch. I’d recommend grabbing these issues through Marvel Unlimited if you can. And finally we make our way to the six issues that compose the primary Annihilation story arc. Thanos! Galactus! The Kree Empire! It’s great stuff, followed by an epilogue of sorts with the Heralds of Galactus tie-ins. We are now officially post-Annihilation, but seeing as these events had an enormous impact on Richie, it makes the most sense to read his first three issues after Annihilation (as well as after Civil War). That said, the remainder of the first Nova trade continues into Annihilation: Conquest, and you don’t want that yet! So hang tight! Great reading order for one of the best comic crossovers of all time. Little question re: the mini-series order. Shouldn’t the reading order for book 2 be reversed? So it would be Silver Surfer, Super Skrull and Ronan, considering they begin on Annihilation Day +17, +41 and + 88 respectively. It really should have been Annihilation book 1 then book 2 then Annihilation: Prologue. FYI. I just wanted to add here that in May this year (2014) Marvel released the Annihilation Omnibus which collects everything listed here, save for Nova 1-3 (which is more of an epilogue related to poor Richard Rider). In terms of efficiency it doesn’t get any better than that. They were even kind enough to include some additional artwork and the rough sketches for your viewing pleasure. That’s a great point, thanks Chris!